We have plenty of shade in rainy western Washington (some might say too much, but we disagree) but most of our broadleaf trees prefer the sun; however, the trees described here love to hang out in the shade! A neglected beauty, cascara makes a stunning addition to the landscape. 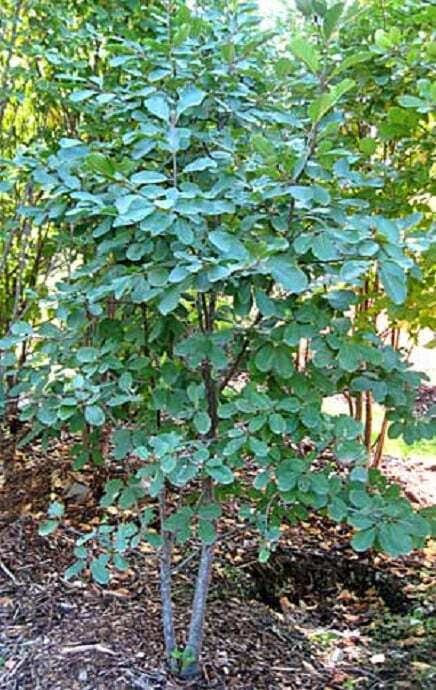 A small tree that reaches about 25-30′, cascara sports dark green, glossy leaves with prominent parallel veins, a bit reminiscent of dogwood leaves. The deep blue, edible berries attract birds like crazy, and in fall, the foliage develops beautiful yellow-bronze hues. It’s hard to understand why this gem has not been planted more widely in the landscape – perhaps due to an unfounded reputation for sensitivity to air pollution. In fact, this tree has been on Portland, Oregon’s list of approved street trees for years, and those street trees are doing fine despite the car exhaust fumes. Cascaras were nearly wiped out in the early twentieth century, when the bark was harvested to make laxatives. Okay, you could argue this is really a tall shrub, not a tree, but you can’t argue with the delicate leaves, pale green bark and glowing fall colors of this small maple. 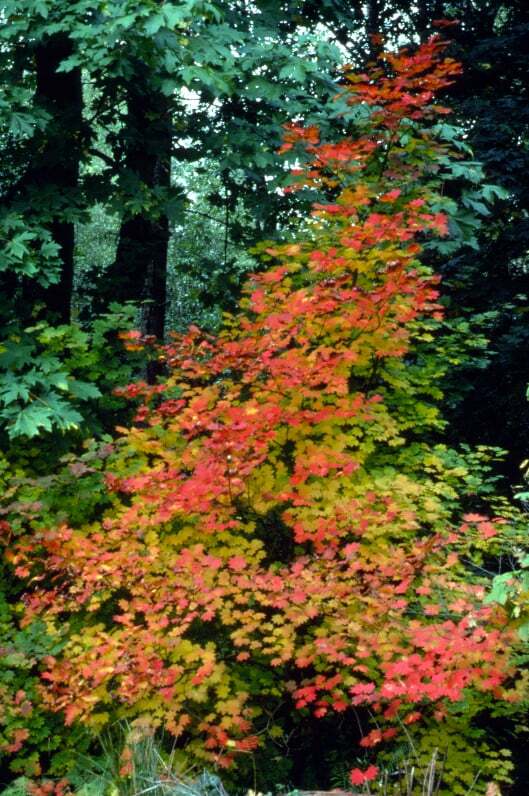 In fact, vine maple may grow as a small single-stem tree when planted in the open, though the classic multiple-branched form is much more common. The next you are tempted to plant a Japanese maple, consider this tree instead. As long as you don’t mind the greater height (up to about 25′), vine maples will reward you with interesting forms and low maintenance requirements. These trees prefer medium to moist soils.